Yarram Secondary College provides quality learning opportunities for students in years 7-12 in a rural community 220 kilometres east of Melbourne. The township of Yarram has a population of 2,100 and the College has approximately 260 students, catering for students from neighbouring townships. There is something said for keeping the best ‘til last. We had a quick group photo on North East Herald with the crew from the Iron Joy before they sailed over the horizon towards Cairns. We steamed the short distance to South West Herald Cay to arrive in yet another paradise. The reef system here is large and impressive and every shade of blue is accounted for. Many eyed the reef with desires for sea based discovery rather than land based. Yesterday and today I had the pleasure of Skype sessions with students from Yarram Secondary College and Welshpool and District Primary School. It was a fantastic to have the opportunity to chat with the students back home and was encouraging to hear their questions were relevant to the blogs. I’d like to thank Ryan and Nik, TJ and John for taking the time to share with the students their work and knowledge. After lunch we jumped in for a snorkel. The visibility was easily 30 m and we drifted over the coral enjoying the colour below. There was a collection of corals, sea urchins, small butterfly fish, coralline algae, wrasses, top snails, algae and large parrot fish just to name a few. We drifted out over the reef to the drop off, where the water depth drops to about 18 meters and the sea is the most gorgeous blue and you can look far out into the open, me all the while scanning for the sharks. I flattened my battery taking photo after photo, just hoping that one will be able to do the reef justice. The island was no less spectacular. The sea birds have been a definite highlight for me. The colours that line the eyes and beak of the boobies, the bright red balloon throat of the Frigate bird and the gorgeous pearlescent pink feathers of the tropic bird. They are truly a wondrous sight and again I hope my photos have been able to capture the colour and beauty. Tomorrow we set off back to Cairns. Our trip of bio discovery over. I may be starting to repeat myself but these islands are spectacular. North East Herald Cay is quite a large island 1 km across the front and thick with Pisonia trees and octopus plants. We are very close to the continental shelf here, with the water depth dropping to 500m only a short distance from the South west side of the island. This morning we had an early start with TJ Lawson from CSIRO doing a standardised marine debris survey that has been completed across most of the Australian coastline at 100 km intervals. As school groups we can also become involved in this. The methodology is easy to follow and our data can contribute to a national data bank. This morning we walked the beach and collected data at three transects. Starting at the water’s edge we walked up the beach and identified marine debris with a size class at set intervals. There was so much rubbish. Water bottles, half a fridge, crates, a rusted gas bottle, a large jerry can, a tuna tracking device, plastic floats and ropes, and thousands of tiny pieces of micro plastics. The clean-up crew have cleaned 10 islands in 10 days. In the afternoon we travelled on the Iron Joy and completed 3X 15 minute trawls using a plankton net to collect micro plastics. This is the 7th set of trawls the Iron Joy have completed and only one has failed to collect micro-plastics. Micro-plastics are a huge problem. CSIRO predict that by 2050 99% of the world’s sea bird will accidently ingest plastic. Tiny microfilaments and pieces of floating plastic. All best laid plans can come unstuck. Monday’s plan was to collect the overnighters from Coringa Island and head to a nearby island for another survey. The weather had other ideas. About 4 am the wind turned and blew from the south west and a heavy rain squall came through. We heard a breaking sound on the anchor chain and everyone jumped to work. The crew pulled up anchor and we travelled to the other side of the island to find some ‘shelter’. We had four scientists on the island who had been working over night with the light trap collecting insects, moths and spiders. The challenge was to collect the scientists and their paraphernalia and deposit them safely back on the ship. “The sea was angry that day my friends, like an old man trying to send back soup at a deli”. The surge made it difficult for a shore to tender transfer but even more difficult from tender to The Odyssey. It took three trips to collect the scientists and their equipment. The scientists had to jump from the tender and swim to a life buoy and get dragged unceremoniously onto the duck board. The gear was loaded into large canvas bags and hoisted aboard using the crane. After a two hour operation all were safely on board, the crew cheered for their professionalism and we took off for North East Herald Cay. A six hour (or 3 movie) steam west, northwest and we have arrived in a lovely safe anchorage, ready for our last 2 days of collection. We arrived at Coringa Islet early morning to meet up with the Coral Sea Clean-up team onboard the Iron Joy. 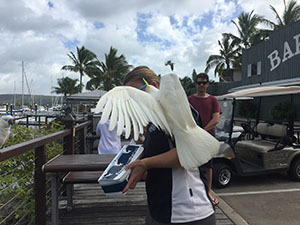 This team includes scientists and staff from Parks Australia and CSIRO and representatives from Tangaroa Blue, Take 3 and The Surfrider Foundation. Today we would be helping with an island clean up. The Clean-up team have been on the go for 8 days, cleaning up 4 islands before today. So far they have collected approximately 1 tonne of marine debris. All debris is hand collected and bagged and then weighed before transport to the boat. On the boat it is sorted according to type (eg. rubber, foam, plastic, metal) and all information is entered into a handheld data tracker. After it is all sorted it is packed ‘tetris style” into the hull. The hull is now full and they are starting to stack it on the deck. By far plastic debris is the most common, with plastic fishing buoys common but plastic bottles ranked highest. Some plastic bottles are so common they have their own category. I was surprised to hear that bleach bottles are frequently found. Apparently some Indonesian fishermen use bleach to stun the fish and collect them for sale. We trekked off along the beach picking up all the debris that can be seen. The main target of the morning collection was to dig out and remove a huge piece of shipping rope that had been located in the sand. It took a crew about 40 mins to dig and saw the rope so that it could be untangled for transport. It was 72 m long, about 12 cm diameter and weighed about 360 kg. Cut into smaller lengths the rope was carried caterpillar style along the beach to a collection point for transport to the Iron Joy. Even in shorter lengths and many hands it still felt incredibly heavy on my shoulders. The clean up is strenuous work, and it is obvious this team has been working hard. At the end of the day I am encouraged by the dedicated work of the likes of Matt from Tangaroa Blue, Tim from Take 3 and Andy from The Surfrider’s Foundation. These three passionate guys, working for not-for-profit organisations, are tackling the big issues of marine debris and doing their bit to get the word out there. It’s probably a good time for us all to think about how we can reduce the amount of plastic in our lives and REDUCE, RESUSE, RECYCLE. As a marine biology student I dreamed of being part of a research team on a remote tropical island. I would never have thought that I would achieve that dream as a science teacher in South Gippsland. What an amazing adventure it is turning out to be. My first impressions of the East Diamond Islet were of the gorgeous blue water and the sea birds. Hundreds of Frigate birds, noddies and boobies and thousands of terns. Before today I had never seen a Great Frigate Bird and here on this small islet there were hundreds. Their bright red throats billowing out as they hover above. They are beautiful. The sheer numbers and various interactions observed amongst the birds was truly a spectacular sight to see. The birds were nesting in the trees, in the grasses and on the beach. Some were sitting on eggs, some had young newly hatched, and others older fledglings. They never stopped. There were birds in flight, others hovering like kites above us, some squawking and squabbling, others tending to young day and night. I have tried to capture this spectacle in a video. For my day of discovery I was paired with Barbara Baehr in search of spiders. At each site Bush Blitz scientists survey a ‘standard site’ where all the scientists search for their chosen species within this area. Barbara and I set up a line of ten pit traps with a fence approximately 10 metres long. I like Barbara’s sampling technique it is something that is easily replicated for school groups. The idea is the insects, spiders and lizards, run along the fence line until they fall into the pit. Simple and effective enough. We also sampled leaf litter, sifted this to only keep the smallest stuff and then commenced searching for spiders. I quickly found out you need a keen eye and a quick finger to collect these spiders. We found wolf spiders of various sizes but the majority were Goblin spiders and pseudo scorpions, all smaller than 2 mm long. I soon got my eye in and felt quite confident in picking the difference between the red speck that was a mite and the red speck that was a goblin spider. My favourite were the pseudo scorpions (tiny scorpion-like critters without a stinger). I have tried to photograph this. The picture quality is lacking but remember it’s only 2 mm long. A few of us were lucky enough to camp on the beach for the night as some of the insect collection needs to be done at night. Spotlighting for spiders and light traps for moths and insects. We spent the twilight sorting through samples and spent darker hours spotlighting. Andreas Zwick was sitting up all night working a light trap designed to catch moths. The wind was making his job difficult, so he caught most of his moths with a net as they flew towards the light. However, it has to be said that the highlight of the evening was dinner. At 8 pm I found myself sitting back in my “wander what” chair on the white sandy beach, eating lamb shanks that had been ferried over from The Odyssey. Superb! Thanks Harry. Waking on the island to the sound of waves lapping nearby and the uneasy feeling of the ground swaying beneath me was a little disorientating, and it was soothing to crawl from the tent onto sand and see the sun was rising on another beautiful day in paradise. Today I snuck in a snorkel and was mesmerised by the movement and colour on the reef. I watched an anemone fish swim amongst an anemone and saw a lovely bright blue trevally. We sorted a few samples of leaf litter looking for spiders, and walked the beach and rock platform turning over rocks looking for an elusive marine spider. Perhaps at the next location. Tonight we are all packed up and ready for an overnight steam to Coringa Islet and to meet up with the team on the Iron Joy. I can’t wait to see what treasures this island has in store. They told us it wold be a long rough trip, but WOW. We left Hamilton Island mooring at 3pm and motored around to Butterfly Bay on Hook Island. We anchored for dinner and a rest and then the crew had us leaving at 3.30 am. The day saw me spend 12 hours sitting out on the back deck, with the fresh air, watching the swell roll past. It was a long day punctuated with a sighting of couple of spinner dolphins, and some terns and Merrick reeling in a skipjack tuna on the troll line. It was delightful to wake up this morning to the sound of the anchor chain dropping. We have arrived at East Diamond Islets for a day of discovery. [NEWS FROM THE WEBSITE EDITOR: The Odyssey is scheduled to depart from Hamilton Island for the Coral Sea later today (Wednesday 15th). Conditions are forecast to be fairly rough, and we’re not expecting any more blog entries from Mrs Cashmore until Friday at the earliest. UPDATE (Thursday afternoon): We’ve just received a situation report from the Odyssey. The position of the boat at 13:50 is shown on the maps below: click to enlarge them. All is well, but it’s still windy, and the waves are still big, so some of the passengers have been sea-sick. The Odyssey should arrive at the Diamond Islets at about sunrise tomorrow morning. The position of the Odyssey on Thursday June 16 – Google Earth view. Note New Caledonia (the long skinny island on the right hand side). What a great day. With a couple of days waiting ahead, many of the scientists were keen to get out of the harbour, have a look around and start collecting. We steamed out to Hook Island for a snorkel in Butterfly Bay. My favourite was a giant blue clam. Did anyone have that on their list? We also saw a green turtle that swam up to the boat for a look. Andrew Hosie was collecting samples of coral looking for barnacles that attach to the coral as larvae and then live embedded in the coral structure. We are staying in Hamilton Island Marina for a couple of nights while we wait for the weather to calm down. I can think of worse places to wait. We had a few hours to wander around the island. Eating fish and chips here amongst the birds is worse than at Port Albert with the seagulls. Not many seagulls fighting for your chips, there were however currawongs, crows, lorikeets and cockatoos all lined up for your chips.